Finally! A place that serves shawarma without rendering the meat into a dry rubbery mess. 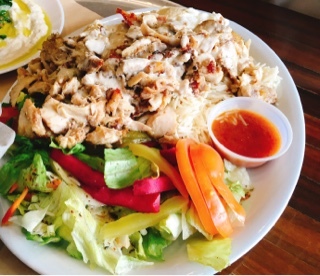 M'Zaar’s chicken shawarma platter ($11.49 for a large) remains moist, perhaps from using a fattier cut (evident from the oil slick remaining on the plate). Where the dish lacks in healthiness it makes up with flavour, so tasty that I didn’t even need additional condiments except for a splash of hot sauce for heat. Unlike other restaurants where the garlic sauce is fluffy and the consistency of frosting, M’Zaar’s is runnier and reminds me of a very garlicky baba ghannouj. Mixed into the huge mound of fragrant rice, along the with the chicken’s juices, it was a rich and filling meal. Thankfully, the platter does arrive with green salad and pickled vegetables to add some freshness to an otherwise heavy dish. The baba ghannouj ($5.29) is silky smooth with a light roasted eggplant essence peeking through. I rather enjoyed the bits of tabouleh sprinkled over top to add a spark of flavour. 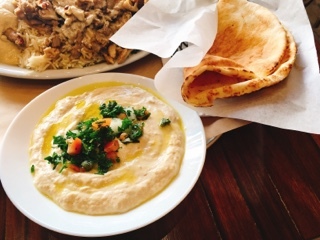 Served with a warm pita, the dip is a surprisingly hefty portion for the low price. Sharing the two dishes with a friend, we were more than satisfied and still had a bit leftover. M’Zaar a laid-back small quick-service restaurant. It isn’t fancy and lacks air conditioning, so in the warmer months try to score a table by the door. Nonetheless, the owner/chef greets you warmly and their food is plentiful and delicious. 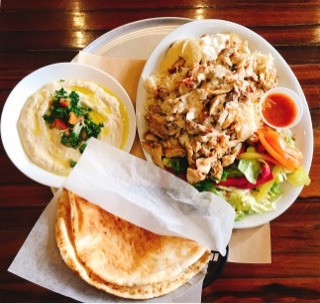 Their chicken shawarma, from my past experiences, is one of the best I’ve tried.